Very strange. But usually in this case, like it was with ytmp3.cc when they switched from youtubemp3.cc domain, you could see similar parabolic growth of traffic. This happens when initial traffic is redirected to the new site from the old one. It also happens when new resource has great traffic from the start.. Which is usually not the case..
Easy-youtube-mp3.com has a very generic name, so it could have gained some traffic from google search, but i doubt that. Plus they are using an API for mp3 delivery, so this is kinda double murky… Usually google is careful with such sites.. So probably all that traffic was from the previous domain name..
What can I say about easy-youtube-mp3.com? Site is very generic, just has a handful of words on it, so SEO avenues do not explain its recent popularity boost. What is the reason? Their facebook page and posts there kinda indicate that this was a surprise for the site owner too.. Where does this immediate popularity come from? 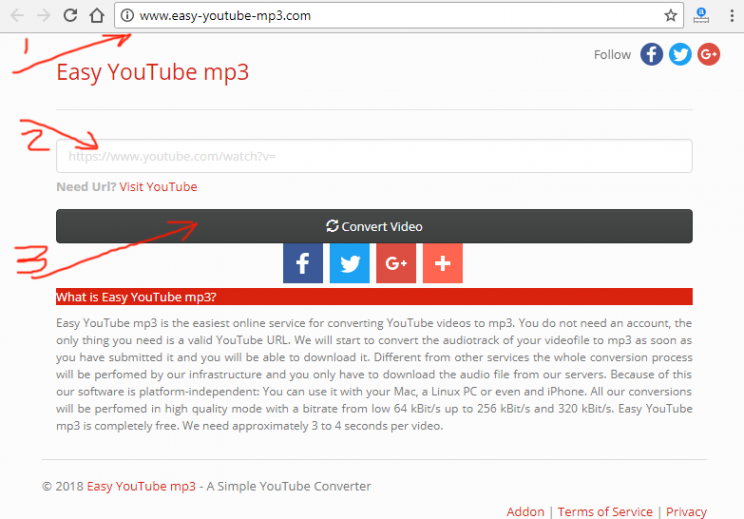 Site doesn’t do any mp3 conversion on their own, they use an API from youtubemp3api.com, one of many generic youtube mp3 converter APIs that showed up recently. I understand this trend, site operators try to hide their trail, hide the way they get those mp3s. They make sure no conversions are happening right on the server. Probably to comply with this ghost claim that having video and audio on the server physically (for conversion) is actually more or less dangerous than not having it. I personally think about my savetube as a platform for me to simply talk about sites that facilitate these illegal conversions and downloads.. But if it boils down to essence, youtube mp3 converter sites simply open the door to users to commit this crime of getting copyrighted materials for free.. It’s like someone standing on the lookout while others are robbing the place. Is the lookout person also robbing that place? Not really.. But the responsibility remains. So… Anyways, back to review..
Easy-youtube-mp3 takes a few more clicks than usual, but it does provide the info on the video, to confirm proper URL, and it offers several options for mp3 download, such as bitrate (audio quality). Users are free to pick whichever they like. Download then starts, but commences very very slow. Easy-youtube-mp3.com seemingly has no banners or popups, but when you click the final download link for the mp3, that’s when they get you and show that popup. It could be advertising inserted by the API provider. It could be that API site belongs to the same sysop, so it’s all that person’s doing. Check it out, this is how youtubemp3.today works. Uses 5 different APIs and suppresses their ads and popups with HTML5 instructions, telling browser to stop ads from being shown. Yes there are adblocks that cut the ads out of the pages and stuff like that. Here site dictates your browser not to even make steps to show ads, its way better than any adblock software or plugin. Also this site does not provide secure connection. These days with letsencrypt giving out certificates for free, it must be every site owner’s priority – setting up https access. Especially when it deals with grey area downloads…. Proof is in screenshot 1, arrow 1.
for today’s tutorial we will try to download Taylor Swift’s Look What you made me do video from youtube, using easy-youtube-mp3.com. Step 1. Open Easy-youtube-mp3 front page. after that is over, video thumbnail shows up to confirm proper URL. below are 5 quality options for the mp3. Options of 320kbps and 256kbps will sound exactly as options 192kbps, 182kbps will be slightly worse sound, while 64kbps makes it facebook sound quality – very low.. =) but you can still check out this facebook video downloader site.. I am not sure whether i stumbled into this site when it had bandwidth problems, or we can blame slow download speed onto the API provider – youtubemp3api.com – but nevertheless, 17Kb/s download speed??? in 2018??? this is simply ridiculous… Maybe it’s time to search for better API provider? for a faster one? I am not inserting my thumb up or down here.. I am not sure whether to recommend you to use this site or to ward off from it and never come back.. Such a slow download speed… No… Not my cup of tea. So it’s up to you to decide if you like this site or not. I personally don’t. And with all that, editor’s rating is 2 stars.